What if Beyoncé quoted him on her next album? If you haven’t been keeping up with the greatest piece of Beyoncé and Jay Z fanfiction that the internet has ever birthed, stop what you’re doing and enter the surreal, shady, spectacular world of The Lemons. 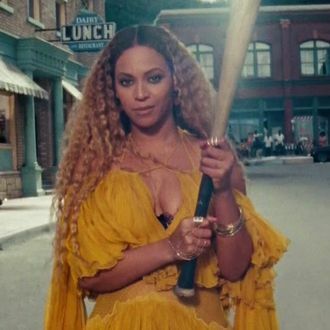 Yes, some fabulous human has flipped Beyoncé’s tale of betrayal and turned it into a two-part saga unfolding on his Wordpress that imagines what must surely be going down right now at the Casa de Knowles-Carter in a post-Lemonade world. It of course stars Beyoncé and Jay Z, but they’re hardly the only ones driving the story to peak hilarity. Among the cast of characters, we also get: Taraji P. Henson, Ava DuVernay, Solange, Mama Tina, Blue Ivy, Kanye West, Kim Kardashian, occasionally J. Cole, occasionally Tyga, and … Prince, resurrected. Enough said. The story has since gone viral and now both Fusion and EW have found its creator. Did you guess that a 27-year-old security guard/producer who lives with his wife and son in Baltimore and won’t cop to actually being in the Beyhive was responsible for such a masterpiece? Praise Beysus, you were right! Introducing Eric Richardson, the man you want writing your biopic. Here’s what he had to say about his newfound fame and the future of The Lemons.